The only thing worse than being misrepresented in your culture, is being disappeared from it. Now imagine how it feels to vacillate between the two. For the full the reImagining gallery - click here! The only thing worse than being misrepresented in your culture, is being disappeared from it. Imagine having to vacillate between the two. If you can, you know what it is to be a Black woman in America. Not Oprah, not Michelle, not Kerry. But the "everyday" Black woman being followed by the store detective. The "everyday" Black woman straining to see herself on TV or in the magazines. The "everyday" Black woman wondering where she fits in this society and why she is not allowed to contradict the false narratives that our culture has heaped upon her. These narratives often lead to a very tragic end. The reImagining is a photography installation conceived out of frustration. Frustration born out of not seeing myself, and those that look like me and have lived through similar experiences, adequately represented in mainstream media, culture, and society. Armed with this frustration, I asked 100 women of African descent to work with me to create a photographic installation to explore the stereotypes that impact their everyday lives, and to create the images that more accurately re-present them as individuals. 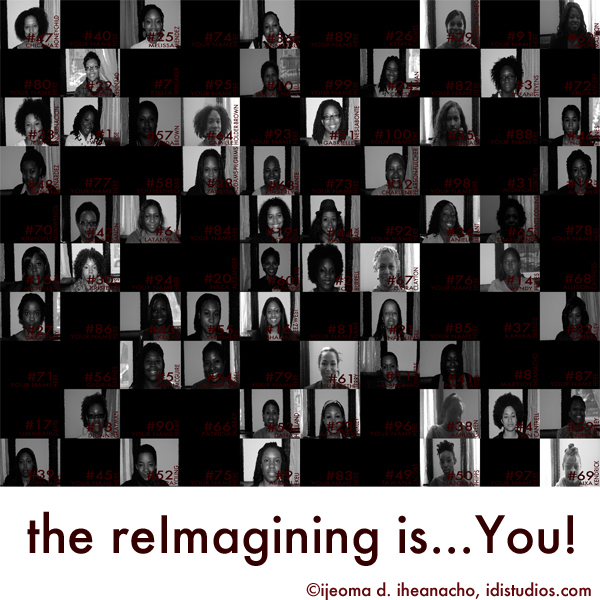 The reImagining is a visual arts project in the process of giving these women the right to determine for themselves the images they want representing them. Ninety-five percent of the 100 women were strangers to me before I started this project. I literally asked women in the grocery store, the subway, the sidewalks of New York City, and even, with the permission of management, during store hours at the Carol’s Daughter flagship store in Harlem to participate in the project. The first reaction for the majority of the women was always to be shocked that I would be interested in them - the individual. This reaction confirmed to me how little society has ever bothered to see these women as individuals and how this lack of recognition has effected their sense of self worth. These 100 women are being asked to bear the darkest part of their existence and the struggle to over come it, then share the result of that journey with the world. The fact that anyone said yes still astounds me. These 100 “everyday” women not only represent themselves, but they are also standing up to speak for their mothers, sisters, aunts, best friends and worst enemies. The strongest and most lasting impact this project will make will be on the lives of these women. The reImagining will give them the courage to speak from the most hidden and vulnerable part of themselves. This project is an opportunity to reclaim their identities not just FROM the world, but FOR themselves. Each woman's journey begins with her answering a three part questionnaire: Who are you? (representing the stereotypes society has placed on her), Who are you, really? (representing the labels she chooses to adhere to), and finally, How do you want the world to see you? (representing the identity she wants to promote to the world). I use this raw text to begin outlining the triptych of each woman’s journey from stereotype to self expression - often parsing the text down to a single word used as a spring board for the image. I then reconvene with the model to create detailed mock ups of the images to be captured - focusing on telling the narrative she feels best represents her. We layout the overall narrative to be told, the lighting, the hair and makeup, costuming, background, and the encompassing "feel" of the images. The three sets of images created thus far have given rise to the themes of the politics of “blackness”, colorism, and Black femininity. The physical realization of the project has been designed to be able to reach as broad an audience as possible. The triptychs have been designed as 4’x2’ plexi glass frames that can be suspend from the ceiling, hung on a wall, or displayed on an easel depending on the requirements of the exhibition site. While I will reach out to galleries that can display the full 100 frames, I will also reach out to community spaces that may require the exhibition to scale down to fit the space. I want to be able to bring the project to the communities these women are from as well as to demonstrate to other communities the importance of these women’s voices. The reImagining is art made not just for art’s sake. It is a project created to be a watershed moment in the American conversation on race and gender, as well as a personal triumph for each woman. I measure the success of the project in the completion of each triptych, the documentation of each women’s journey to self-reclaimation. This impact can clearly be seen in the journey captured by Model #14. The theme of her journey was the examination of what actually represents Black “femininity”. She bravely shared with the world how the inability to bear children has affected her and how she has been able to make her womanhood whole despite her hysterectomy. Needless to say that photo shoot was filled with tears, but also a release of the burden of the emotions she held onto for so many years. The impact of this project will be the impact of all art, individual but universal. For everyone who will see Model #14 bravely share her story, the impact will be there. I will use the creation of the reImagining as a teaching moment. I plan to invite community outreach organizations dedicated to fostering the building of self esteem for high risk adolescents, with a focus on young Black women, to work with me to create programming based on the photo shoots and eventual exhibits that will focus on the creation of self esteem so the young women can start formulating their own identities at an early age. The 300 images created for the reImagining and the corresponding text and videos will be curated into a traveling exhibition to be presented in both formal galleries and community spaces. I want to bring these images back to the communities these women originate from as well as introduce them into spaces that have traditionally overlooked such images. As these women's communities are often underrepresented in the arts, I plan to partner with local organizations to create exhibitions and educational programming in community spaces like community centers, religious spaces, and pop up venues in urban settings. It is my hope to make the reImagining a larger force in the Black female cultural representation by turning the traveling exhibition into a book format that can have a larger reach through academic settings ranging from grade school to university lectures. To fully document the project I will create a dedicated website that will allow more women to not only go online and respond to the themes raised by the reImagining, but to also connect and become a support system to help foster deep connections within the Black female community as well as the world at large. Click here for the full reImagining Speaks videos. 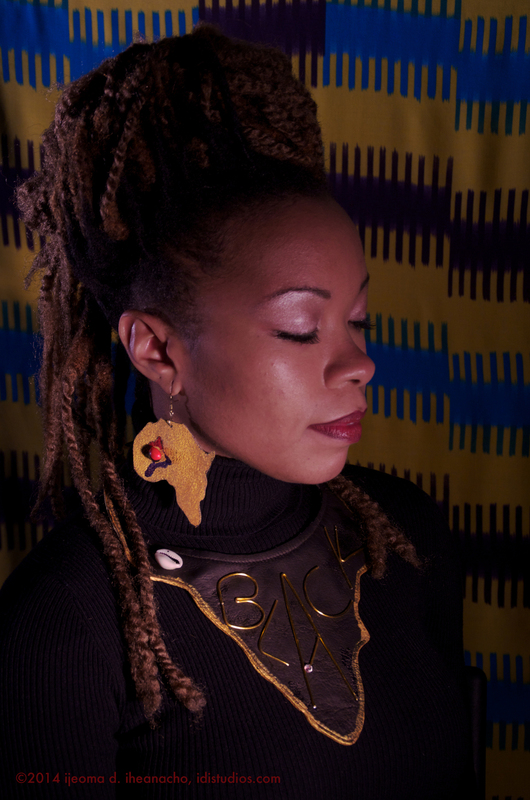 Click here to see artist, Ijeoma D. Iheanacho speaking about the reImagining on BronxNet!